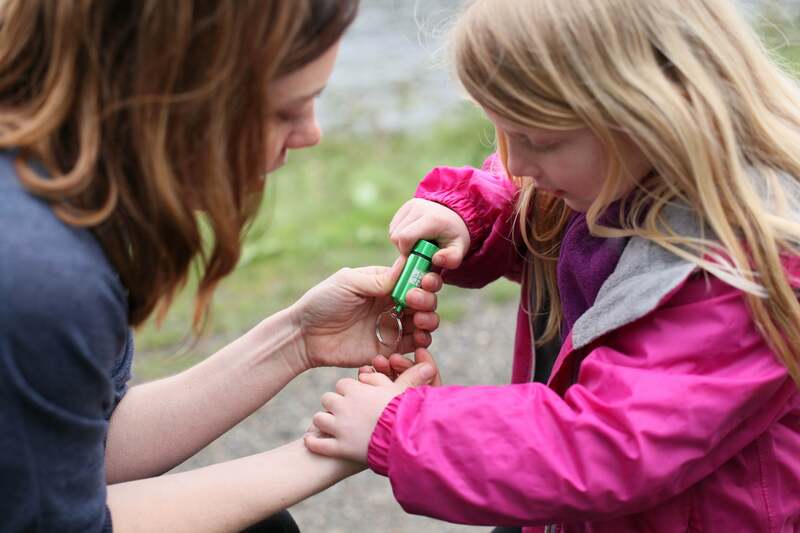 Children learn navigational skills by geocaching. Photo courtesy of geocaching.com. When you want a fun, free outdoor activity that you can do during your Fort Myers Beach vacation, geocaching is a great option. Geocaching has been described as a high-tech treasure hunt. All you need is a free geocaching mobile app or a GPS device, and you’re on your way to discovering the world around you. Start by opening a free account at geocaching.com. This is the official site for everything you need to know about this activity. If you haven’t gone geocaching before, watch this 75-second video to learn what’s involved. Now, just put in your location to follow your GPS toward the nearest geocache. It is likely very close. All geocaches have a name and description, tell how difficult they are, and mention if the terrain requires any physical exertion. Geocaches can be in places like parks, forests or urban settings. There are dozens along and near Fort Myers Beach. 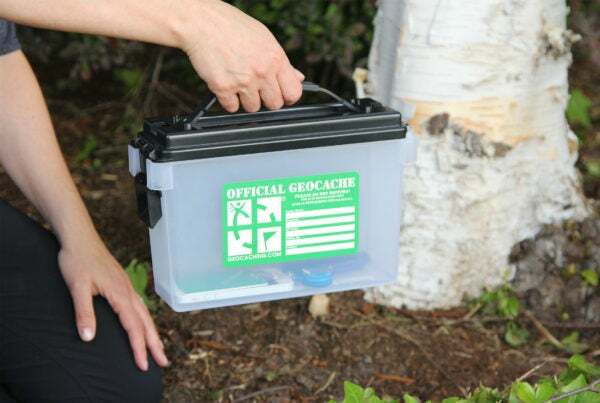 A geocache is typically in a waterproof container. Photo courtesy of geocaching.com. You’re looking for a waterproof container that may be hanging from a tree, magnetically attached to the back or underside something metal, or underneath a bush but not so hidden that you have to dig for it. Follow the clues that are provided. Some geocache locations are even virtual, meaning you must submit a photo of yourself at the location. Inside the geocache container – which can be very small or fairly large – you will find a log book (and hopefully a pen or pencil, but always carry your own) that you complete, verifying that you found the geocache. You may also find small trinkets or prizes, including small toys, buttons or special geocache coins. You can even bring your own knickknacks, including a custom-made coin, to trade for one in the geocache. Part of the fun is putting down your device before you are directly upon the geocache and thinking about where you would hide one in that location. If you can’t find it, look on the app for tips from people who recently did. Put the cache back where you found it, so the next person can discover it. Florida State Parks has geocache tracking sheets, including one for children. It is estimated that approximately 3 million people participate in geocaching worldwide, with about 3 million geocaches placed in more than 180 countries. Florida’s state parks – including Lovers Key State Park, Delnor-Wiggins State Park and Koreshan Historic State Park – participate with Operation Recreation GeoTour. Download the main GeoTour Tracking Sheet and the Kids GeoTour Tracking Sheet. For the main tour, visit 20 caches and win the Official Operation Recreation Geocoin. 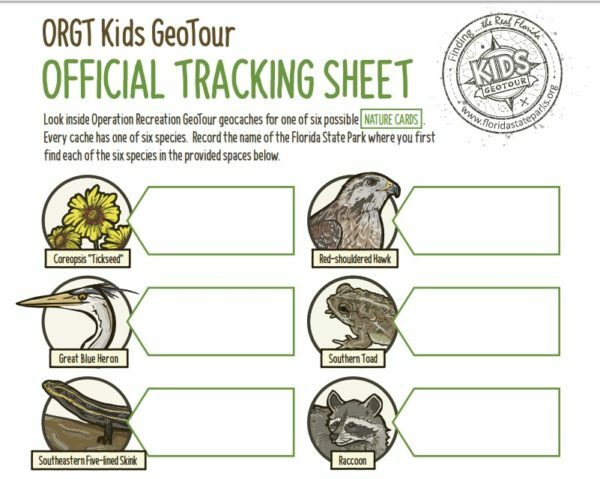 For the kids tour, find all six species and win the ORGT Kids GeoTour Geocoin. Click here to find geocache locations by a town in Florida, such as Fort Myers Beach. EarthCaches are great for older children because they are educational and offer an earth science lesson. These sites must highlight a unique feature and require geocachers to do a task, such as identify trees or take measurements. Yellowstone National Park, for example, has EarthCaches about geysers and hot springs. Locally, there are EarthCaches at Bowditch Point Park, CREW Marsh and Wild Turkey Strand Preserve, among other sites. Find your family-friendly Sun Palace vacation home that will be your home base for your geocaching adventures during your trip.